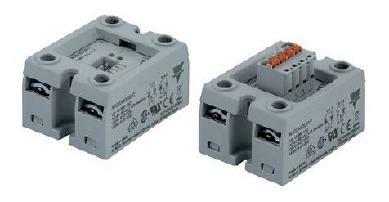 Carlo Gavazzi's RK series consists of 2-pole solid state relays contained in one housing with the possibility to control each pole independently (RKD2.. models) or both poles together (RK2.. models). Ratings for both versions go up to 600 VAC, 75 AAC per pole. The RK..C models have control termination through a 2.54mm pitch connector. Terminated cables to mate with the RK..C are available and have to be ordered separately. The RK..P models have control termination with a 5.08mm pitch plug connector. In this case, the control plug is shipped with the solid state relay. • Space savings. The RK series consists of two solid state relays contained in one housing having a product width of 45mm. • Fast installation. The RK solid state relay is ready for mounting to panel chassis or heatsink as the backplate is equipped with a pre-attached thermal interface. • Easy wiring. The RK..P models are equipped with a pluggable spring terminal for easy and fast wiring of control connections. • Low equipment downtime. The output of each pole is protected against over-voltages with an integrated transil. • Long lifetime. Wire bonding technology reduces thermal and mechanical stresses of the output chips allowing a larger number of operational cycles compared to other assembly technologies. • User friendly. LED indication per pole for visual indication of control status. 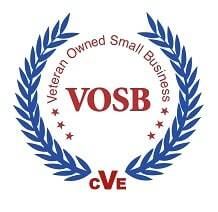 • Food & Beverage certification conformance. The RK is certified for 100,000 cycle endurance test according to UL508. 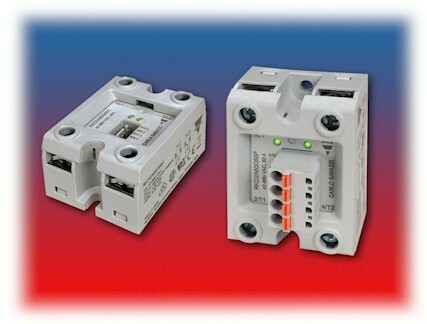 Control Components is an authorized distributor of Carlo Gavazzi.